Hellboy’s back in hell, but not quite what you are thinking. Beyond the home coming, there is a lot more that is going to happen in this three part series coming out from Dark Horse. Number 1 just hit the streets, and being a Hellboy fan I am pretty happy with this comic book. The comic starts off with a couple fleeing from a raging volcano, and arguing over whether to get on the train or not get on the train. Seriously, they should have thought about this a lot earlier as the train is packed with people fleeing the volcano. If they miss this one there is really no way of getting out of town, and that is pretty much so what we are thinking is going to happen here. The good part is that the train is on its way to hell with their big old dog, and a girl that is very nervous about the whole thing because she knows something horrible is going to happen, and since this is BPRD, yeah, you can guess with certainty that horrible things are going to happen. The cool part about the comic is that you really get an idea of Mignola’s idea of hell really is all about and how he feels about the idea of Hades. No fiery pits, but many bat weird things that like to fly around and oh yeah, eat your face off. 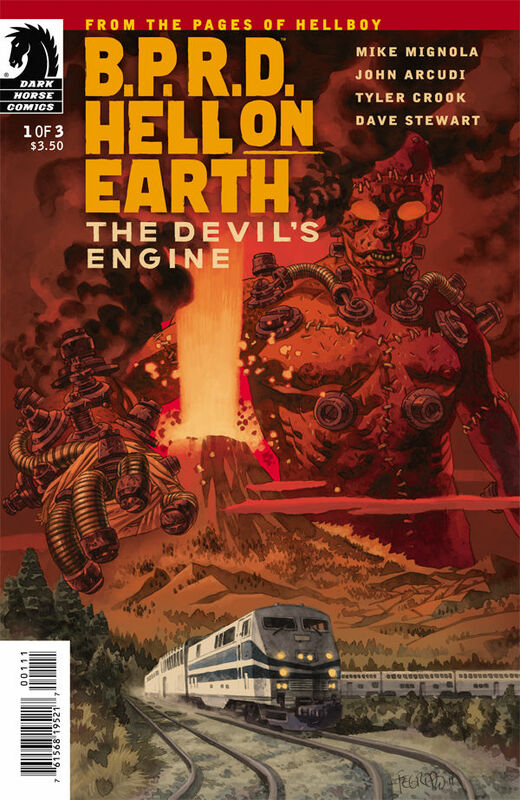 Mikes idea of hell is an interesting blend of mythology and original ideas making the trip though the devils engine more interesting than if it was just what we expected from a Judeo-Christian viewpoint. The comic book is fairly jammed packed once you get through the set scenes of a couple arguing at a train depot while the volcano spews ash and junk into the air. In all this was an interesting comic book to read, and up to what we have come to expect from BPRD. You will not be disappointed by this comic book, not even a little bit. I will rate this one five of five stars, because it is a rousing story that is simply enjoyable for BPRD fans, and hellboy fans. While I could have used a bit less arguing and losing the dog, over all once you get through the scene setup’s it simply rocks along the path, and you get some very awesome imagry to go along with the incredible story line. Too bad this will only be a three issue mini-series, if you miss this one, it will probably end up in a trade compilation of these smaller but interesting story lines. Well worth getting, well worth reading, well worth keeping in its physical form, it is a must get for Hellboy fans.